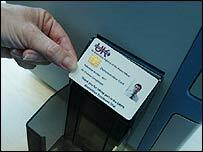 BBC NEWS | Programmes | File on 4 | Will ID cards prove an IT flop? Will ID cards prove an IT flop? Will the ID card technology work? This month, the Government is expected to issue the first tenders for the controversial ID card scheme. Ministers say the scheme will help combat fraud and terrorism but, with the technology untested and costs rising, is it set to become another expensive IT disaster? Everyone over the age of 16 applying for a passport will have their details including fingerprints, eye or facial scans added to a National Identity Register from 2008. With the first identity cards set to be issued in 2009, Sarah Spiller investigates the scheme.